Lead yourself first. Then lead others and move together toward a more expanded and hopeful vision. Your leadership is needed in all areas of your life: in relationships, in business, in your family and community. You can make things better in any role you occupy. 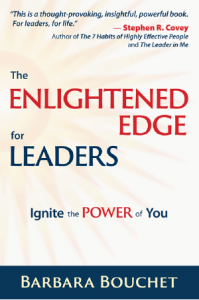 The Enlightened Edge for Leaders is a roadmap. It will teach you the specific tools, resources, and processes that will help you flourish as a leader. The more you invest in your expanding edge of growth, the more powerfully you can influence everything you touch. Buy the Book! It has been endorsed by many highly respected leaders (see below). You can read the introduction here. You can also learn more about it here. 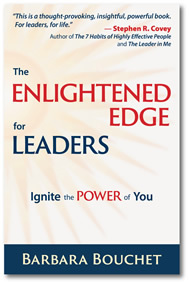 Subscribe to the Enlightened Edge to receive more information and tools. Inquire about any new groups that Barbara is offering. You can also contact her directly to discuss options for coaching.